In the words of Ansel Adams “A good photograph is knowing where to stand”. The thought holds true for shooting a reportage. The subject, when shooting as a photo-journalist is common (coverage of natural calamities, documentation of a city, journals of famous personalities, etc) and what makes the difference is how you interpret the scene. The same fact is brought about by professional reportage photographer Enzo Dal Verme in his book titled “How To Shoot A Reportage”. Enzo has presented the information in the structured manner. He starts with building a ground for inspiring the beginners to work as the photo-journalist and then provides an entire guide to how to shoot a reportage. He talks about pre-planning (right from packing the bag to planning the strategy for making the most from the trip), good habits, composition & other techniques and the final tasks before submitting the work to magazine editors. One of the best thing about the book is that it provides valuable and easy to remember composition tips. While other books talk about composition in terms of rules of thirds, rule of odds and golden ratio; Enzo has presented the composition in terms of practical tips. This book is a must read for all the photography enthusiasts and hobbyists, to not only understand what to photograph and how to photograph when you work as a photo-journalist, but as a photographer in general. I personally feel that this book can be a source of inspiration for the beginners, but is highly targeted for those interested in making money from photography. To The Point: The author has an impressive style of expressing; be it in words or through the photographs. The author does justice with the book title, by providing the required information to the point — nothing much, nothing less. 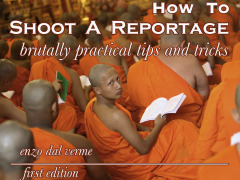 Offers Practical Tips: “How To Shoot A Reportage” is not just another photography book. It is in fact, a compilation of practical tips and techniques (learned by Enzo through his mistakes and experience). Summarizes The Real Facts: Enzo brings about the real facts of the publishing market and inspires the beginners to work in the right direction. He shares his own experiences as a professional reportage photographer and his style of handling the issues (and making the most from the end moment changes in the plan, which he takes as an opportunity). The Photographs: All the photographs published in the book weave a story around itself. Along with three C’s of a photograph (composition, color and creativity), all the images have one thing in common — unique perspective; which is of utmost importance when shooting a reportage (covering the reality with a difference). Who can be a better person to teach you the tricks of trade than a pro himself. Here is Enzo Dal Verme’s ebook presenting the excerpts from his own experience as a photo-journalist. Check out the ebook today to get hold of top tricks and secrets of becoming a photo story teller. The ebook is available as EPUB version for € 4.99 and PDF version for € 8.59. You can purchase the ebook here.